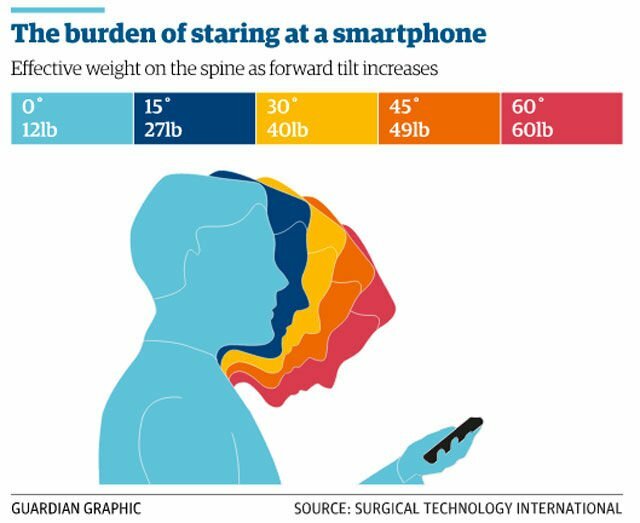 In an age when so many of us are using smartphones, tablets and laptops for hours on end, it’s no wonder neck pain is becoming one of the most common conditions we treat at Nolan Osteopathy. One condition in particular is becoming very common and has become known as “text neck”. Look around you today and you’re almost guaranteed to see someone looking at their digital device, with their head hanging forward, contributing to bad posture. When the neck tissue is stretched for a long period of time, it gets inflamed and sore and it can cause muscle strain, pinched nerves and herniated discs. Over time, this poor posture can permanently impact on the neck’s natural curve, resulting in early wear-and-tear or degeneration of the spine, which may ultimately lead to surgery. To put this into perspective, consider the following. The average human head is estimated to weigh around 10-12 lbs (4.5 – 5.5 kilos). One research study from the US National Library of Medicine showed that when the neck bends forward and down, the weight on the cervical spine (neck) increases. When your head is bent forward by 45 degrees for an extended period of time, the pressure on your cervical spine is estimated to quadruple to 49 lbs. This is the equivalent of having 22 one kilo bags of sugar hanging around your neck. In this day and age, trying to avoid using our digital devices is nearly impossible, but the good news is that there are some things you can be doing consistently to help avoid “text neck” and neck pain in general. Use your eyes to look at your device. There is no need to bend your neck. Side Bend Neck stretch: Start in a standing or sitting position with your head in a neutral position. Gently bring your ear towards your shoulder until you feel a gentle stretch in the muscles on the opposite side of your neck. Do not lift the shoulder towards the ear! If you’d like to find out more about “text neck” or neck pain or any of the issues discussed above, please feel free to contact us at enquiries@nolanosteopathy.co.uk for more information.